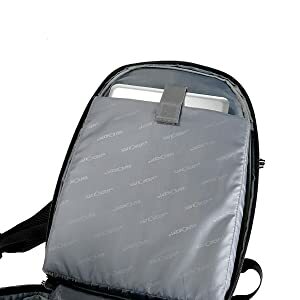 Comprar K&F Concept mochila para cámara fotografía 29cm x 22cm x 45cm en línea, envío gratis y 30 días de garantía de devolución. • 【Con Gran Capacidad 】 La mochila para equipo fotográfico se adecua para una cámara, multiples lentes, flash y tableta 14". • 【Con Resistente Interior】 En el interior hay velcro de acolchado resistente y suave.El espacio interior de esta mochila para cámara se permite ajustar e incluso quitarlo según sus necesidades con los 8 divisores.Para mayor seguridad a transportar y protege de golpes y caídas. • 【Con Porte Innovador】 El diseño sobre dos partes, el compartimiento superior para la ropa y los artículos personales, y el bajo para equipos fotograficas. 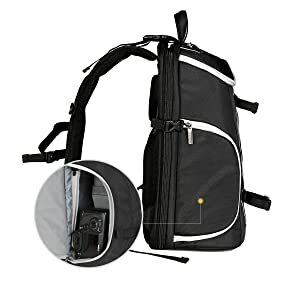 • 【Con Acceso Rápido a Cámara】 En los dos Lados de mochila DSLR hay aperturas con cremalleras, puede sacar y poner su cámara rápidamente y fácilmente. • 【Con Correa Seguro】 La correa ajustable entre bolsa y cintas de los hombros ayuda a ajustar la posición de la bolsa y su opresión a la espalda. La cámara mochila es una buena opción para los fotógrafos y también puede funcionar como una bolsa de tránsito durante un largo viaje. 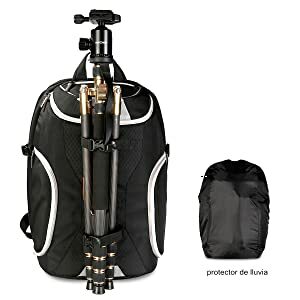 En los dos Lados de mochila DSLR hay aperturas con cremalleras, puede sacar y poner su cámara rápidamente y fácilmente. La parte posterior de la mochila se abre totalmente para un acceso completo y sin problemas al compartimento interno y a tu material fotográfico. 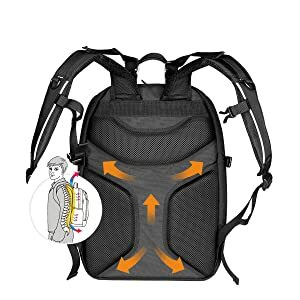 El diseño de correa frontal para trípode hace a la mochila mantiene el equilibrio cuando se transporte.Te da una comodidad definitiva y deja libre tus manos. La mochila permite poner un ordenador portátil que no más de 14", puede satisfacer sus necesidades diarias. Diseñada con un espeso respaldo acolchado, más cómodo y respirable. I thought I'd hold off writing this review for a few weeks so that I could speak from a position of experience, rather than the honeymoon period of a new purchase.First off, why did I choose K & F Concept? Well, a few months ago I was looking for a decent tripod but didn't want to pay premium brand prices. After much research I decided to take plunge on a tripod by K & F. I was instantly impressed. It had a quality feel, did what it was meant to, proved to be a solid mount, and yet all this at well below premium prices. I therefore decided to keep K & F on my radar for future purchases.The inevitable day came when I decided a rucsac would be in order for carrying my expanding kit. 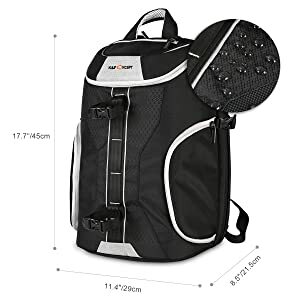 An extensive period of research followed that saw me considering other brands such as Lowepro, Manfrotto, and the host of other lesser known brands on Amazon. But I kept coming back to this product from K & F.Of note, here's what I like (and in no particular order):+ Quality build, stitching and materials.+ My Dell Inspiron 15 fits perfectly into the laptop sleeve (photography and post is now all in one location when travelling).+ The laptop sleeve is against your back which is exactly where you want the weightiest object.+ Well padded throughout the whole pack.+ Padding creates a shell like, monocoque effect giving the pack a good shape.+ Easily accessible top pocket, perfect for keys, wallet, sunnies etc.+ Rain cover.+ Tripod mount (see negatives below).+ Ample room for a DSLR and approx 4 lenses. A nifty fifty, an 85mm, and something wide would easily be accommodated. (Mines a D80 with a Tamron 18 - 270 fitted).+ Convenient grab handle at the top which gets used a lot.+ The pack came with a complimentary cleaning kit; puffer, brush, spray bottle and lens cloth.+ Dedicated filter / memory card flap.+ Quick side access to camera whilst pack is still on the left shoulder.What I think could be improved:- The tripod mount. Other packs have a pull out pocket that supports the tripod's legs. (Yup, that's it, and still 5 stars from me).In sum, for the money I'm very impressed. With a quality feel, it contains several features that other premium brands don't seem to be able to match for the price. It's well thought out and a great grab-and-go pack that has accompanied me on several photography forays.Well done K & F. Another thumbs up from me. this is a great item. compact but lots of space. I opted for the one with a pocket at the top to put food and maps and such. its waterproof and comfortable to wear on long hikes. It's also slimline enough to slip into my much larger camping backpack so gold stars all around. The only add on which would make it even greater would be if there was an external net pocket just over the two side flaps - easy to slip stuff in whilst hiking would have been great. Very good pack. Very happy.Great size, not too big but plenty of room for a day out with various lenses and accessories. Comfortable. Well built, should last well. Overall good value.Best bits:Solidly built;Main compartment quick access side panel;Top and side ‘trinket’ zipped pockets for small items like batteries, SD cards, cleaning kit etc;Plenty of space for a day out with camera and 5 additional lenses, speedlite and 13” laptop plus lots of other small items (or sandwiches! );Main compartment interior zipped safety ‘net’ nice feature to save lenses falling out when opening main zip;Main zip has padlock rings which I’d use if wearing in crowded areas;Comfortable to wear, chest strap with up and down adjustment nice touch;Tripod straps and accessory loops;Inconspicuous so not too obvious it’s a camera bag;Shoulder cinching straps to pull pack closer to body;Waterproof cover;Mine came with a complimentary cleaning kit which I wasn’t expecting!LimitationsAlways need more small pockets, could be plenty more both outside and inside main compartment;One or two additional padded velcroed dividers for main compartment would be handy to allow more configurations (I always carry camera in hand so rarely need to store camera in the pack);Accessory loops in same place as tripod straps, so use one or other but not both, so how about additional accessory strap loops on sides also.Maybe top straps to hold coat.Declaration: I received a discount from K&F to try this bag completely without any conditions whatsoever. I offered to submit a review once I received the pack, and these are my own experiences of this bag ‘warts and all’.